I can’t say too much about the performance of my new toys yet, but I do have a few early observations. First off, bigger is definitely better for me. I haven’t been complaining about my previous iPhone X or the 42 mm Apple Watch, as both were certainly big enough. However, the XS Max and the 44 mm Apple Watch Series 4 are both just right there in the sweet spot for me. The Max will be the first iPhone that my big thumbs won’t hold me back typing on. I know just from entering all of my account and information during setup that the keyboard is going to work a lot better for me. As for the Apple Watch, it is even better. those two extra millimeters and higher resolution make a BIG difference to me. The visibility is perfect. The bigger touch targets on the screen are even better. I will never mess up a passcode again! I don’t see any issues with the size of the Apple Watch. The larger screen may bother some, but it won’t be an issue for me. However, there is one notable drawback to using the XS Max: one-handed operation goes out the window. It is just too big to reach all the way up to Control Center, which is triggered with a swipe down from the far-right corner with one hand. As such, there are certain things that will require two hands because of the size. Again, this isn’t a problem for me. However, if a larger size isn’t what you are looking for, then don’t get this phone! If you like the iPhone X/XS form factor and size, then stick with those models for the time being. Pocketibility also takes a definite hit with the iPhone XS Max. The extra size and weight do show up when you put this bad boy in a pants pocket. It definitely fits in most pockets, but if you are on the fence, I would recommend making the drive to your nearest Apple Store and test driving before you buy. 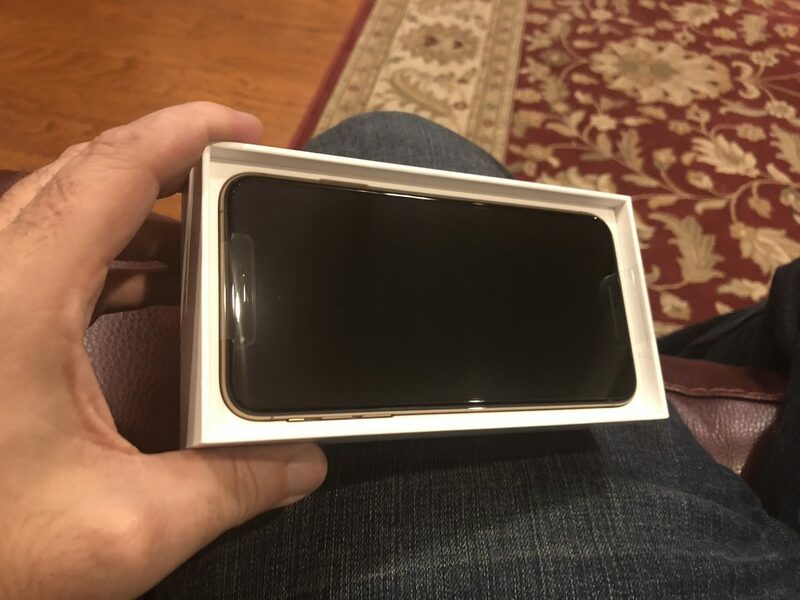 I have heard some complaints from other reviewers regarding the Gold iPhone XS and XS Max. That’s not the case for me. I much prefer the gold we got here to the rosy gold color we got last year on the iPhones 8 and Apple Watch Series 3. There is still a little tint there, but this version doesn’t trend toward pink like last year’s. The gold back is muted and professional looking, so I’m a fan. My iPhone is STILL downloading apps and restoring odds and ends, so I am going to head to bed while it finishes things up. I’m excited after day one, because the sizes of both of these new devices are going to help me in real, practical ways.